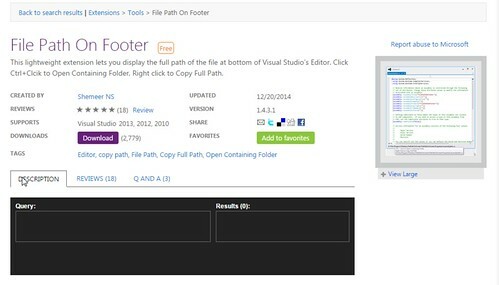 Click here to download File Path On Footer extension from Visual Studio Gallery. This lightweight extension lets you display the full path of the file at bottom of Visual Studio’s Editor. Click Ctrl+Clcik to Open Containing Folder, Right click to Copy Full Path. This will be very helpful if you are working on files which is having similiar and or same name. Visual Studio IDE already shows the file path when you hover the mouse over the document tab but I like to see the file name always on bottom of editor. So we know where we are. Note: Rarely theme change will be reflected only after restarting visual studio. Intrested to see how to create an extension like this then read “Getting Started with Visual Studio Editor Margin Extension” from CodeProject.com. 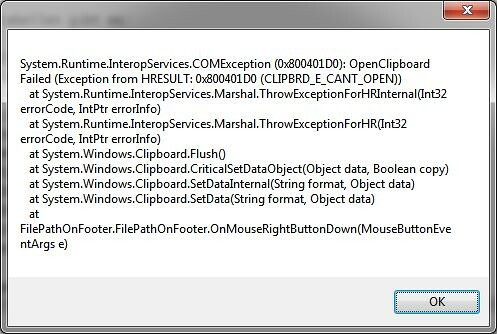 Sincerely “File Path On Footer” raised an exception yesterday trying to open the clipboard. After closing the exception I tried again, the desired file path came into the clipboard, but VS2013 crash and restarted. After the restart I couldn’t reproduce the problem. Any chance to catch such exceptions, like when raised while failing when trying to open the clipboard? I will try to handle unhandled exceptions in next version. please let me know if I can easily replicate this issue. Thanks for reporting this issue. Please update it to version 1.4.1.
please share a quick review in vsgallery. I just find a little bug when the extension is activate and you try to run a SQL Query in VS 2013 (don’t try in 2012). i hope you can correct it in a new version. This issue has been already taken care in version 1.4. I will be releasing that in couple of hours. please show your support by giving a quick review. It only takes a few seconds. It’s ok for SQL Query and i didn’t find another bug (for the moment 😉 ). sincerely your extension raises, the first time used with the right mouse button, the exception to be seen in the screenshot https://farm9.staticflickr.com/8591/15384297273_a98ba898a6.jpg. Any chance for fixing this? Is the file path copied to clipboard after the getting this exception also ? Yes, the path got copied! I have fixed this issue in version 1.4.3 and also added support for custom environment font settings. Please update. Sorry, but … your visual studio gallery page for “File Path On Footer” (https://visualstudiogallery.msdn.microsoft.com/d9fc97d4-3b42-4b56-ba47-23f8b81ebd17) returns an error. Even updating from within VS2013 is currently impossible. Visual Studio Gallery page is back. Please check. All image files got deleted while Visual Studio Gallery team worked on the page issue. Now I need to upload the image files again. Download works without any issue. Yes, download to update the extension works, but after the successful update, the VS extensions dialog does not mark the extension as updated and the “download” button is still working to download and to start the installation of the extension, which itself denies to install again. Any chance you’d consider open-sourcing this? I’d love to change this extension to only display a relative path. Hello, I require some time to re-arrange the code for making it open source. I like the relative path idea, I can get the relative path option added in this plugin, can you tell me how you would like to configure the relative path? Hello, I’m using Visual Studio 2015 RC with your File Path On Footer extension, but I meet two issues. First it doesn’t fit Visual Studio’s dark theme. Thanks for the findings, Surely will roll out a new version with these fixes. Hello, Can you try with latest version 1.4.5. *Theme support may not be working for RC version. It no longer crashes, thank you! VSGallery team was working on that issue, I do see that the page is up but image are not there and its downloading PowerShellTools.vsix. Let me check that. Don’t know why the page is getting issues. VStudio team is working on this issue, Have shared the provided screenshot with them. Please try now, Page is back. Good Morning from Berlin! Update to the current version now worked! Thanks for your efforts! Nice extension. Would it possible to make the text selectable? I sometimes have cases where I’d like to copy partial paths, especially when working between branches. Nice extension. Would it possible to make the text selectable? I have scenarios where I’d like to copy partial paths (for example, when working between branches). I am enjoying your extension. I am currently using it on VS 2015 and other then it always having a white background, it seems to work great. Is it possible to make it so it only shows on the bottom when I do a split screen? When I do a split, it shows it on the bottom of both parts and shows the same information. Added this to ToDo List. Since working with UI Zoom of 150% I have often the situation, that VS2013 places the current execution line – after hitting a breakpoint – right behind the file path. In consequence I have to scroll before I can see the current execution line. Before using the UI Zoom I didn’t have this “problem”. Could it be, that VS2013 does not know about this UI element, so it places the current execution line “behind” it? again and again VS2013 places the stop of an execution at a breakpoint right behind the “File path on footer” UI elements. So I still think, that VS2013 does not really know, that its current execution line is hidden by the UI elements of “File Path On Footer”. Could please take a look? Sure Martin, Let me check, Hope this issue is not there when you do 150% zoom with this plugin. question: would it be possible to extend theme support for high-contrast theming (accessiblity theme)? I need to use the high-contrast-#1 theme as desktop theme and VS2015 automatically uses the “high contrast” theme, which has black window background, yellow window text, white frame color, green selection color, etc.. While VS2013 used a kind of dark theme to emulate the high contrast mode, VS2015 does not. And so your extension looks dark with white text in VS2013 and light with black text in VS2015. BTW – all images on this page are “gone”, not loaded! Need to update the URL as old image URLs are broken from VSGallery. Ever used “File Path on Footer” while peeking into code? In VS2015 the file path is even shown in in-place code views (peeks)! And even here the in-place code views don’t seem to know about the used area – like when VS2013/15 places the current execution line after stopping at a break point right below the area of “File Path on Footer”. Any solution available or thinkable, but uninstalling? I’m okay showing file path while peeking code, are you thinking different? is within peek areas, right? extension UI hides the code within the peek area!